Welcome to DigMB.com's second weekly recap of action from the Manhattan Beach Little League and Manhattan Beach Girls Softball. 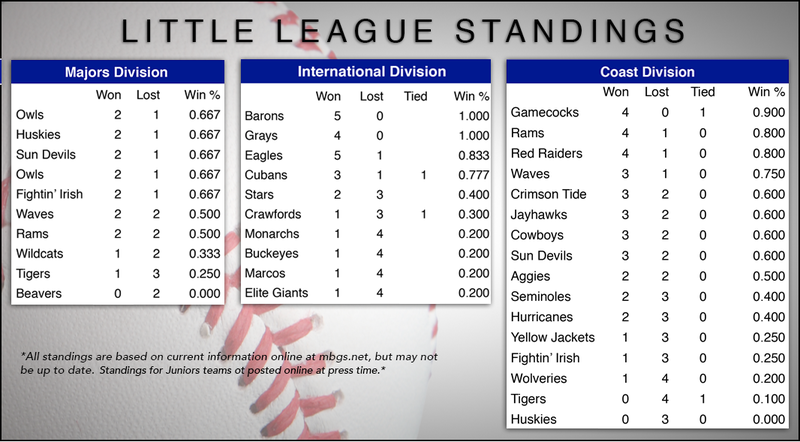 This week we have reports from the Major and International divisions in Little League. Submissions will be edited and published by DigMB! The Major division of the Manhattan Beach Little League is for boys 10-12 years old by April 30 who are refining all the skills they have been building up in the Minor divisions in this next stage of competitive baseball. Major Baseball is also known as the Little League Baseball Division. The Rams delivered the first shutout of the Major's season with a 6-0 win over the previously undefeated Sun Devils. Strong pitching by Jonah Storey and Jackson Zobrist held the Sun Devils to three hits. Most of the game was a close defensive battle and the Rams only pulled away in the later innings. On the game’s first pitch, Jonah Storey homered to give the Rams a quick 1-0 lead. The fans then watched another 147 pitches thrown before another run scored. The Sun Devils first threatened the Ram 1-0 lead in the bottom of the first when Alex Rohm barely prevented a steal attempt on home base. The Sun Devils next threatened in the bottom of the third inning when with two outs, bases loaded, Jackson Zobrist took the mound. On a pressure-filled 3-2 pitch, he delivered a strike and retired the side. The Rams clung to their 1-0 lead until the fifth inning when Jason Proano clubbed a two-run double and was then plated on a Jack Shaw single. In the sixth inning, Brian Stinson padded the Rams lead with an RBI double and ultimately scored the final Rams run on a ball hit by Garrett Baliton. With two outs bottom of the sixth, pitcher Zach Zawacki struck out the only Sun Devil batter he faced to preserve the 6-0 shutout. The International division of the Manhattan Beach Little League is for boys 10-11 years old by April 30. It's the second level of competitive kid-pitch baseball, one step above the Coast division. The Grays pushed their winning streak to 5 games behind a strong pitching performance by Kevin Jackson, Kyle Tinker, Myles Idrovo and Myles Gaffney, beating the Stars 17-3. Ryan Bui homered again (his second of the season), going deep over the center field fence at Marine Complex. Jonah Storey takes the first pitch of the game over the fence to give the Rams an early 1-0 lead against the Sun Devils. Rams catcher Alex Rohm gets his glove on a Sun Devils runner attempting to steal home plate in the bottom of the first inning.